We've been back in Phuket for a bit more than 24 hours after our trip to Chumphon and Prachuap Khiri Khan. What a tiring 24 hours! Our drive back was taken slowly. A couple of reasons for this... My parents were involved in a traffic collision in England on Thursday - the same day we were driving up to Chumphon. A car hit them from behind as they were stopped on a country road waiting for another car turning right... Also the weather was not great, although the 6th started nice and sunny, (of course, the day we are driving is sunny). Also, not long after starting our journey we were stopped at a police check who advised us of radar checks ahead and told us not to drive more than 110 kilometers/hour (68 mph). Once you reach Surat Thani there are 2 routes. 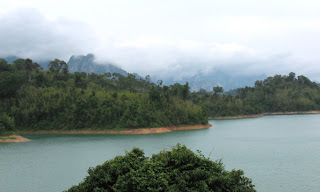 We took the fast road coming from Phuket.. we took the slow road via the Rachaprapha Dam (part of Khao Sok National Park - read more here: Khao Sok Lake). Phuket was pretty sunny when we arrived back. But we caught the traffic. That's one thing in Phuket that has changed noticeably even within the 8+ years I have been here.. a lot more cars. A lot more 4 lane roads. View below at the "Heroines Monument" (the Heroines of Thalang are 2 ladies who rallied the people of Phuket to fight Burmese invaders in 1785 - you can find out more at the Thalang Museum).